LAN Party Exchange - TheLPX - | Where Gamers Find LAN Parties. Seems that my webserver was compromised. I’m currently working on securing the server and slowly restoring content. If you have questions or concerns, please contact lanpartyexchange@gmail.com. Sorry about the interruption. Parlor City LAN is a LAN Party organization in Bluffton, IN focused on bringing together gamers for casual gaming and friendly competition. Parlor City LAN 5.0 is a two-day event. Whether you’re a new comer or repeat attendee, we’ve got some new surprises to make your PCLAN experience great! Overnight sleeping is allowed. You’re welcome to bring sleeping bags, cots, and air mattresses — please be set up by midnight. Showers are available in the locker rooms free of charge — bring all your toiletries! Alcohol is not allowed, however you’re welcome to bring your own food and drinks — fridge, freezer, and microwaves are available to use. Lanwar send out an email recently to all past attendees about MML 15, so I’m passing it onto all potential attendees. It’s that time! Registration is Open! How big will this one be?? January was awesome (over 400 gamers !!!). Will this be the event that we max out the hall? We can’t wait for another four days straight of gaming insanity. Hard to believe it this is number 15. Don’t forget to check out our Facebook page for the latest updates and announcements. Got a blast from the past you would like to see again? Give a call out on Facebook and we’ll all try to help track them down. We will have Team Seating for those that don’t get seats together on their own. But get your team seating in now, we cannot guarantee a team move as the even draws nearer. Tournaments? We want to hear from you! Reply to this email with what tournaments you would like run. Remember, while we will let the final verdict go to the highest signups, we do have some in mind. o Your favorite here? Reply to this email with the game you want to see most! Fun Tourneys? We got those! We will have our usual gamer favorites. And will be adding more to the list like always. This is just a sampling. In 3 weeks, 350+ people will gather in Louisville, KY for Million Man LAN 15. This annual LANWAR event has been held every year since 2002. In that time, LANWAR has put over 8200 gamers in seats. MML15 sponsors can be found here. The current schedule is posted on the right and if anything changes in the schedule, it can be found on their Google Doc. For more the most updated information check their Facebook page or LANWAR.com. FortCon is happening this weekend, Friday, Saturday and Sunday. The schedule of events is posted including speakers, tournaments, and other activities. It’s a 3 day event and seats are still available. They only have 56 BYOC seats left out of 256 total seats. If you are interested in attending or already signed up FortCon Staff has a message for you. Set-Up & Tear-Down – Tasks: running cords, organizing tables, odd jobs as needed. Registration – Tasks: Helping attendees check in, monitor doors, answer questions. Streaming – Tasks: Aiding in 24/7 stream of event, including production, file set-up for stream, and possible interviewing/on-screen or casting time. Vendor Aids – Tasks: Assist vendors during event, help attendees with VR demo booth, other duties as needed. If you are interested in helping out, please email fortconvolunteers@gmail.com your details and preferences and we’ll get you placed in a team. Volunteer Raffle Tickets: We understand your time at FortCON is valuable, so for every 4 hours you help out FortCON, you will be given ticket for the Volunteer only Raffle to be held at the end of the event. You need not be present to win. You will be able to earn as any as you’d like. Thanks and we’ll see you soon for the LARGEST LAN in Northeastern Indiana! Everything is ready for ParlorCityLAN. Tournaments are announced, schedule is posted and seats are still available for one of my favorite LAN Parties in Indiana. It’s only $20 for a 2 day event where you can sleep and shower at the venue (HUGE Perk IMO). Also included are free snacks at the venue and they have free and discounted food vouchers from local food establishments in their Grub Giveaway. So why aren’t you signed up yet? Well if you need more convincing, here is more information. No Latency LAN has updated some information for their LAN Party. They have seats still available for those interested in attending. Just wanted to give you guys an update! We’ve been working hard on getting all the pieces together for the LAN and are sitting almost 2 weeks out! We have secured our internet at the Enoch building and are looking to have over 200mb/s usable throughout the event! I would still come prepared with all of your games updated as it will still take a while to update if you haven’t. There will be LAN servers running at the event. So far I’ve created two 10-man 128 tick CS:GO servers, a 32 man TF2 server, Quake Live, 32-man CS:GO Casual, and we will have an on-site Mumble server for comms. We have room for more so if you have any suggestions, please let us know! Registration for the League tournament is ready! You can sign up for the tournament here. Last, we’re going to have t-shirts available at the LAN. They’ll be $15 and are helping us raise money for Easton’s Angels. 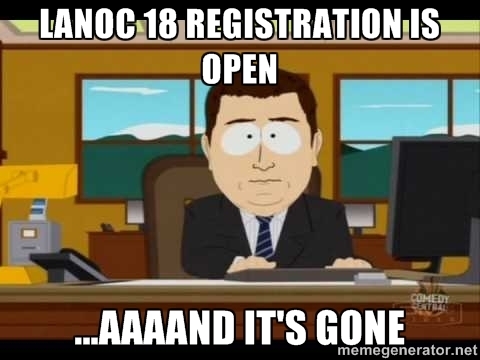 Not sure on the exact time, but LanOCv18 sold out in less than a day. 150 seats gone, paid for and ready to LAN Party on March 19, 2016 at 10am until March 20, 2016 6pm at the Van Wert County Council-Aging 220 Fox Rd Van Wert, OH 45891. If you are someone looking to attend, head over to the LANOC forums and post in this thread. Tournaments are being nominated here, so everyone post Rocket League please. LANWAR 58 is two weeks out and we now have an official schedule. LANWAR 58 is January 15-17 and they just hit 300 gamers paid and registered! Only 50 paid attendees until they giveaway 7 seats. They have Zalman, SteelSeries, Bawls and CPU Magazine as sponsors so far. Official Tournaments at LANWAR 58 will be Counter-Strike: Global Offensive 5v5 and League of Legends (Free Download) for team tournaments. With Hearthstone (Free Download), Super Smash Bros Wii U, and TrackMania Nations Forever (Free Download) for non team based gaming. LANWAR also has loads of Un-official (Fun) Tournaments. Some of which are Duct Tape Wars, Heroes of the Storm, Rocket League, Settlers of Catan, SpeedRunners, Starcraft 2: Legacy of the Void, and Texas Holdem. Of these tournaments, TheLPX will be running the Starcraft 2: Legacy of the Void tournament and assisting Spatula City with the Rocket League tournament. LANWAR via their Facebook page mentions they have 1Gbps symmetric pipe (so 1Gbps Up and 1Gbps Down). That way you can stream as much as you want. They warn however, that even a 1Gbps pipe can get saturated (especially early in the event) when everyone is downloading new games on steam so please help avoid that by updating your games before the event.